Year ends are a time to introspect and to plan the upcoming year. Above all this is the time to Thank all those who have touched you in the past year and have helped you thrive against all ups and downs of life. This year I want to Thank all of our Confident Ecosystem of Customers, Partners and ourTeams globally to make sure that we grow with razor sharp focus and soar confidently like the Condor in our New Year. I want to Thank my family and kids for staying by with me in all the things I have experienced and lived by through years as a Father, Husband and a Son, Board Member, Angel Investor, Global Speaker, World Traveller, Musician and latest as a newly minted Black Belt TaeKwondo martial artist. I want to wish a Great New Year for you and your family and want to share the three things with you from my 2015 experiences as we ring in the New Year. Most of us have a tendency to be in a Race always. We get so much obsessed with the idea of beating others that we forget our own game plan, direction and turns and end up going in a wrong direction. If an actor on stage concentrates on other character’s moves solely, he forgets his own moves. This year take a resolution to compete with the most important force – your own self. Every passing moment either we are evolving or degenerating. So Race with yourself and evolve, as an Entrepreneur, Educated Citizen and a Passionate Person in work and life. A seed grows into a tree only if it accepts the confinement of the Earth. This 2016 take an oath to be disciplined. Set the right Rules and Controls and abide by them. The world witnessed a lot of Cyber threats, Data security breaches and scams in the year 2015. Let’s take a lesson and define the right Rules and Controls and implement Good Governance and Transparency in our Offices and in our Life. Through my Martial Arts and Music experiences and spending time with my kids watching and learning the playbook of the 2015 PlayOff seasons of American Football (NFL) I can assure you that the above three have helped me a lot in leading Confidently! So Here’s to your Super Successful and Confident 2016! 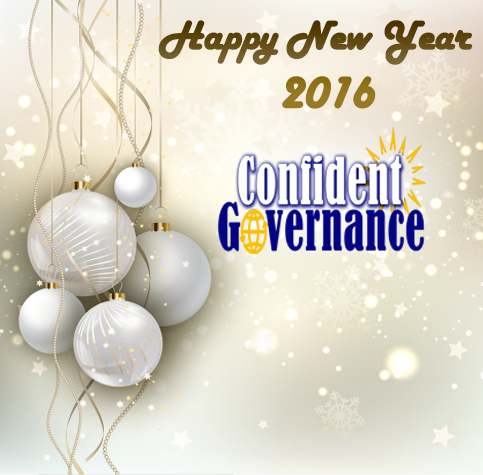 from all os us at Confident Governance and EnCrisp. Let’s Stay in touch and Collaborate in 2016.